Every night I tuck my boys in to bed with numerous snuggles and kisses. And I say the same thing to them, a little ritual of words that started with just a few lines and was appended and adjusted as I felt I needed to throw in a life lesson or confidence booster... like "I love you every day, all the time, no matter what," or "You make me so happy and I'm so proud of you." When I was done the other night my little Bug hugged me extra hard and said he was now ok to go to sleep because I had said it all and it helps him relax. Given that most nights he interrupts me to tell me about a random part of a game he played, or a thought he had, or an item he'd like to ask Santa for, I was beyond thrilled that perhaps my words are reaching and sticking to the deep recesses of his crazy amazing brain. I know Bear loves what I say. If I sit for too long enjoying a quiet snuggle with him he will grab my hand and say "Say Daddy loves me. You love me..." and wait for me to start. And he nods at the right times. And when it's over I usually get the world's greatest hug and "I YUV YOU TOO!" It's... my favorite time of day. And not because the kids are in bed and I might have a moment or two to myself. But because in those moments of quiet snuggles and daily reflections on all that we have to be thankful for, I feel like I'm (we're) doing an ok job and they're growing up loved, and safe, healthy, and happy. Last night though I had a little meltdown while rocking Bear. I allowed myself to drift down the dark roads of "What if something happened to you (me, Bug, Hubs, etc), a road made quite real when you read blogs or know family and friends with real life heart aching losses) and I cried and cried. 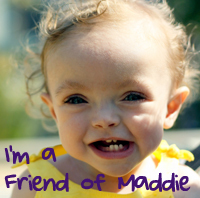 So I'm going to ask you, please, today, to go over to Friends of Maddie and make a donation for what would have been Maddie's 3rd birthday. Despite our grief, and fears, and losses, we have so many reasons to be thankful and hopeful. And I believe we should share that love with others who need it too.